Creamy Tomato MacaroniA friend of mine feeds this to her kids who say it is one of their favourite meals. She'll make it when she doesn't have much time or doesn't feel like cooking. Costs less than $2 and can feed up to 6 people. Rice ParmesanMelt butter in large skillet. Add rice and onion. Cook and stir until rice is lightly browned. Add water, bouillon cube, and mushrooms. Bring to a boil. Stirring until cube dissolves. Cover; remove from heat, let stand 5 minutes. Scotch BrothCombine chicken stock, bones, meat, onion and bay leaf in large soup pot. Bring to a boil and simmer for one hour. Add barley and continue to simmer for 30 minutes. Ground Beef-Vegetable SoupBrown ground beef and drain. Add everything but the macaroni and simmer for 2 hours. Add macaroni and cook additional 1-2 hours. Basil Chive Butter Puree ingredients in a food processor. If the mixture seems too dry, just add a teaspoon of olive oil and repeat if necessary. Continue until smooth. Pineapple Coffee CakeDrain pineapple. 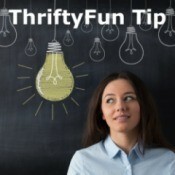 Save 2/3 cup pineapple syrup and mix with 2 cups Bisquick, 1 egg, and 1/4 cup sugar. Pour into well greased 9 inch pan. Cover evenly with drained crushed pineapple and top with 1/4 cup brown sugar. Bake at 400 for 25-30 minutes. Crock Pot Fiesta ChickenPlace chicken seasoned with salt, pepper and coriander or cumin in a crock pot set on low. Top with 1/2 jar salsa. Add corn. About 1 hour prior to serving add the remaining salsa and one can drained black beans, stir and allow to heat. Strawberry Jello SaladDissolve jello in water. 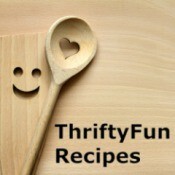 Add partially frozen strawberries, bananas, nuts, pineapple. Pour half in 13x9 inch pan. Let set. Top with sour cream and other half of jello mixture. Chill. 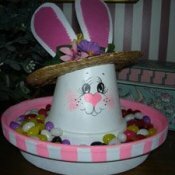 Easter Bunny Candy DishMake a cute bunny candy dish for Easter. Spray paint a terracotta clay pot and saucer white, any size you desire is acceptable. Sponge paint the interior of the saucer with a spring color if you desire. Use Forks as Garden MarkersUse old forks as garden markers. Simply "weave" your seed packets through the tines on forks you no longer use. Stick them in the garden to mark your rows. Even plastic forks could be used, but be sure they are firmly pushed in the ground. 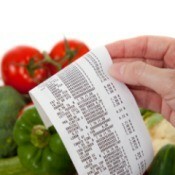 Check Receipt Before Leaving StoreAre you being overcharged for groceries? I am overcharged for my groceries half of the time! That is why I now check my receipt before leaving the store instead of when I get home. 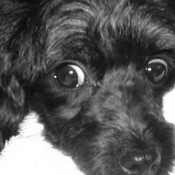 Mickey (Toy Poodle)Mickey is an 8 year old toy poodle. She was a rescue dog that our neighbors were fostering. We adopted her in 2001. Mickey is a snuggler. She loves to be close to her family! She likes to lay on my lap while I knit. Mickey also loves to play chase with her toys. Save and Reuse Snack ContainersWhen I purchase pudding, yogurt or even jello, I save the plastic containers and wash them thoroughly with soap and water. They are the right size to either put snack such as raisins or trail mix in for kids. Windowbox GardeningI grew up on a small farm where we raised practically everything we ate. I've always liked to have some fresh produce growing somewhere. We have downsized to our retirement home and try as I might, I haven't been able to find a suitable place to plant very much of a "Victory Garden." Use Old Bowling Ball for a Garden GlobeRecycle those old bowling balls. Spray them with primer and then spray paint them any color you choose. Use them as garden globes. The size is a little off but they are not so breakable as the glass globes. Your will just have to buy a stand. Use Curb Appeal to Achieve a Quick House SaleWithout a doubt, first impressions count and can be the deciding factor in whether you achieve a quick house sale or not. The idea behind curb appeal is to allow potential buyers to imagine how it will feel living in your house. 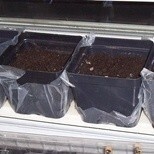 Use Press and Seal for Seedling ContainersWhen planting your seeds for spring and using those pots that you saved from last year, use "Press and Seal" on the bottom of them when you don't have a tray, to keep the water from leaking out. 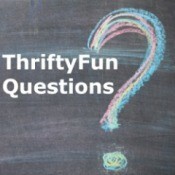 Use Old CDs as a Bird DeterrentDo you have birds making nests on your porch or in your plants? Then get some old CDs you don't want, put a strong string through the hole and tie it and take the other end and tie it to your porch so it hangs down. Use a CD Case for a Recipe Card HolderYou can use a CD case as a recipe holder. To display a recipe during a meal prep open the CD case and bend it back. Then place a recipe card (after cutting the card to fit, if necessary) in the opening. 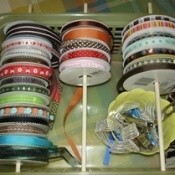 Create Your Own Ribbon HolderCreate your own ribbon holder for less than $2 using leftover materials: use an old wire basket (it is OK if some of the slats are broken) and several 12 inch long dowel rods (or pant hanger cardboard) cut to length. 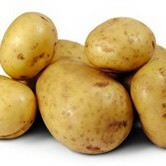 Recipes Using PotatoesPotatoes are an inexpensive ingredient for lots of dishes. What are your favorite recipes using potatoes? Homemade Ant KillerHow can I make ant killer spray using household products? Thawing FishHow do you thaw out frozen fish?